Time Involved: Half day to full day, depending on how much you like to shop. Hours Open: Saturdays, 9:00 AM to 6:00 PM, depending on the weather. How to get there: Take any bus heading south to San Angel, the end of the line. The San Ángel bus station is across the street from the Bazar. Or, take the Metro linea 7 South the Barranca Del Muerto, and then walk or take one of the aforementioned buses South on Revolucion the last two miles to the Bazar Of course, radio or sitio cabs are always an option. As with many other neighborhoods in Mexico City, San Ángel was once an independent town until the late 1940s, and 50s, when the city finally grew up around it. San Ángel still retains its colonial architecture and charm, reminiscent of its esteemed history as the summer residence to many of Mexico’s aristocracy in the eighteen and early nineteen hundreds, as well as Diego Rivera and Frida Kahlo’s residence-turned-muesum. Narrow cobblestone streets, tree-lined plazas, and sprawling haciendas still make up the center of San Angel, only now the plazas contain the Saturday art show and bazaar, and the haciendas play host to craft markets, restaurants and coffee shops. When you arrive at the corner of Revolución and Frontera, you will first encounter the Plaza del Carmen. The fences along the sidewalks will be lined with arguably some of the best artwork to be found for sale in the city. Take a look around, and if something catches your eye, inquire about it to the seller, most likely the artist themselves. Prices generally aren’t cheap, generally from close to $100 US up to even $1000 or $2000 US. Of course, everything is negotiable. If you happen to fall in love with a particular artist’s style, but are short on cash, most will usually have a portfolio of smaller sketches or paintings on paper that can be had fairly cheaply, many less than $30 to $40. That way, when the next time you see your artist’s work is in the Museum of Modern Art, you will have proof when you tell your friends that you discovered them first. Keep heading west up the hill to the main show surrounding the Jardín del Arte. 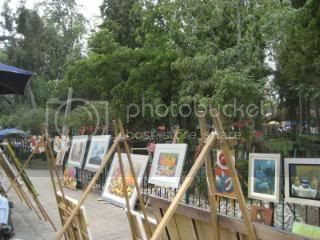 Here, you’ll find more artwork and handicraft stands. Surrounding the plaza are shops containing high-end artwork, furniture and house decorations. On the north side on Calle Miramón is a red building called Plaza San Jacinto, a two story colonial hacienda filled with more handicrafts and artwork. Take a look around, note the sheer size of the house, and wonder what one family did with all that space. The beautiful central garden of the hacienda now houses part of the Restaurante de los Sabados, with the rest of the restaurant located in the back of the house. If it is time to eat, stop in for traditional Mexican fare. Unfortunately, the patio is only available if you order the buffet service, which is a bit pricey at around $200 pesos per person, but it is still a better buy than ordering of the menu. Not to mention the better scenery, and service for that matter. Another alternative for lunch is the Restaurante Saks next door, an organic-style franchise housed in a beautifully restored hacienda. Or, if you’re just looking to quench your thirst, check out the Cantina in the northeast corner of the plaza at Miramón and Frontera. After a rest, head back up east on Miramón to the Bazar del Sabado. The Bazar consists of a large tent with a rectangular aisle lined with booths. 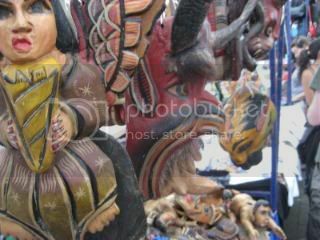 Anything from jewelry and handmade clothing, to devil masks can be found there. Prices are generally good for the quality of the wares. Ask for discounts and you’ll usually be told that it is already a buen precio and that you won’t be able to find it for the same price at other markets, but if you’re buying more than one item, you should normally be able to obtain volume discounts. A sitio taxi stand is available at the entrance to the market, and you should be able to obtain a flat rate before you leave, depending on which colonia you’re heading to. If you’re traveling north by bus, cross over Revolución and check out the Mercado de los Flores, one of the only 24-hour flower shops in the city (and possibly anywhere else). You can also take the north-bound buses here, and avoid the confusion and congestion of the San Ángel bus station. Also of interest is the Templo y Museo del Carmen, on the east side of Revolución next to the bus station. This former convent now houses a museum along with its original inhabitants – a bizarre collection of mummified nuns. Not everyone’s piece of pie, but still interesting.